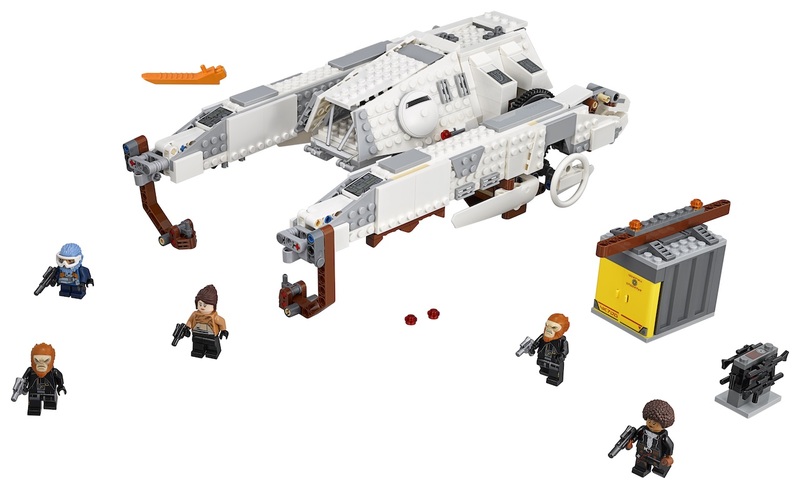 'Solo: A Star Wars Story' gets a LEGO Imperial AT-Hauler this August – AiPT! New ‘Star Wars’ cargo ship and minifigures coming from LEGO. One of the biggest Solo: A Star Wars Story sets is coming out this August with an 829 piece set running $99.99. The set includes 5 minifigures including Qi’ra, Val, and Rio Durant. This set will certainly get you into a heist mood. Check out pictures of the set below as well as additional details. •	Includes 5 LEGO® minifigures: Qi’ra, Val, Rio Durant and 2 of Dryden’s guards. •	Features rotating pylons with movable lifting hooks, an opening minifigure cockpit, side-mounted stud shooters and a platform underneath for carrying minifigures. •	Includes a buildable, opening cargo container with lifting beam. •	Load the container, hook it up and lift it away! •	Rotate the lifter arms for landing and flying modes. •	Weapons include 2 blasters, 3 blaster pistols and 4 rack-mounted blaster rifles inside the container. •	Combines with the 75215 Cloud-Rider Swoop Bikes and 75217 Imperial Conveyex Transport for the ultimate high-speed train heist! •	Recreate exciting scenes from Solo: A Star Wars Story! •	Imperial AT-Hauler measures over 4″ (12cm) high, 12″ (32cm) long and 4″ (21cm) wide.